Windows apps are useful in so many ways and there seems to be one for every action. One that is used a great deal of the time is PDF to Excel Converter and it enables documents saved as PDF to be converted to Excel XLS files. Once converted, it is also possible to make alterations and within a short space of time. There will be an updated document in full MS Excel format and data can be read in the format that is best for you. If the whole file does not need to be viewed as Excel, that is not a problem as sections can be changed and others omitted. Part conversion is much quicker than total conversion, and you get the data you need. Batch mode - 100 PDF files can be converted at one time if batch mode is used. No Excel - Even if you don't have this already installed on the computer, the PDF To Excel Converter program can still be used. Speed - This is around 160% quicker than other conversion apps, saving you valuable time. Conversion is easier and there are only a few steps to follow. The first is to download the app onto your laptop or desktop. Installation will not take long and soon you will be converting the files or partial files. - The file PDF2Excel needs to be double clicked. 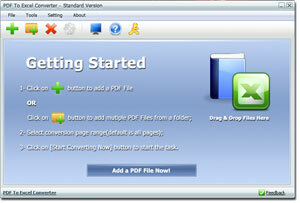 You will see a page headed "Getting started" and a button reading "add a PDF file now". - Click the "Add folder button" and select the file or files that are to be converted. - Find the Output path button. This is at the bottom right hand side of the computer. - Click on the browse button. It is through this that the output path is set. It will lead to the folder for the converted PDF files. - At this stage you can start converting. Click the "Start converting now" button and the conversion will begin right away. Completion will only take a few minutes. There are no risks involved, although there are slight differences when reading the converted PDF document. Every column and row will be analyzed, but some of the PDF forms are not uniform. Once converted, there may be some slight differences, and there will be a slightly different look. Each version is an improvement on the last and it is hoped that this will continue.